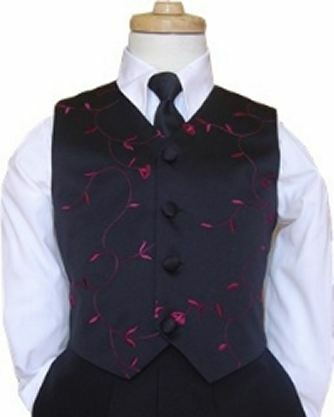 Black satin vest accented with embroidered burgundy vines. Choice of bow tie or long tie in a solid black. Ships in 1 - 2 business days. Sizes 2 - 7. Very nice. Runs small. Order up a size. From the Peanut Butter Kids Collection. Please refer to the PB Kids Boys size chart.